Did you know that if you forget your password to your Video Cloud Studio account, you can request that the password be automatically reset by clicking "Forgot Password?" on the login screen of the Studio. Simply enter your registered email address, enter the CAPTCHA text and hit submit. You should receive an email from Brightcove in about 1-2 minutes. If you do not see this email in your inbox, you should first check your spam or junk folder. If you still don't see it, then perhaps you aren't using the email address that is currently registered to your Studio account and you should submit another email address. If you aren't sure you remember your password, it is best to reset your password right away. Don't try to guess! If you try to guess your password and you fail several times, you will lock yourself out of the account, which will require assistance from our Customer Support team. If you don't recall ever registering or receiving a login to the Video Cloud Studio, but you need one, you should contact the person within your own organization who manages the Brightcove relationship. They are most likely an Administrator of the account, or know who is an Administrator and all Administrators can create new user accounts. 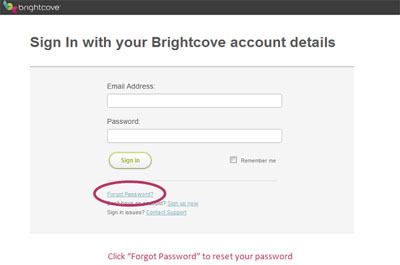 The Brightcove Customer Support team does not create new user accounts for any customer. The appointment and management of user accounts should be up to the individual company's business policies. We value the security of your media.